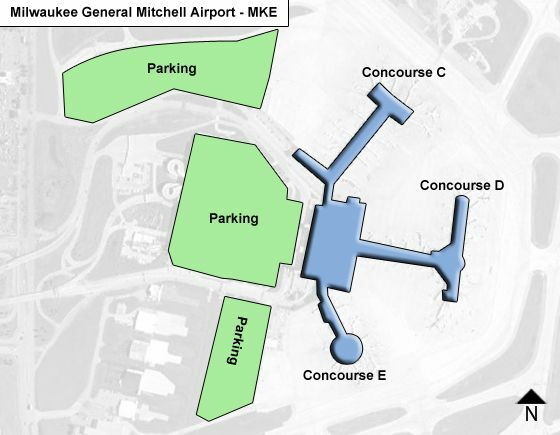 The Terminal complex at Milwaukee Airport MKE consists of two passenger terminals: the two-level Main Terminal with Concourses C, D & E, and the small International Arrivals Terminal*. Both terminals are connected by free shuttle buses, which also serve the parking lots. NOTE: With the baggage claim renovation project completed, the finished Airport Upgrade Project resulted in a rebuilt terminal interior & exterior with larger windows & skylights providing natural light, terrazzo flooring anda new glass canopy over the vehicle roadway - enhancing passenger experience & attracting more airlines & destinations. Passenger pickup at International Arrivals Terminal: At I-94 take the Airport Spur 119 exit, follow signs to ticketing/ check-in/ continue through it and merge to right lane; look for blue 'International Arrivals Terminal' sign at right, turn right into parking lot. Also, the Cell phone waiting lot within the Surface Lot (both provide one hour free parking) is located just before you get to the Main Terminal. The Lower Level houses he ticketing & check-in counters 1 - 7, as well as the newly renovated & spacious baggage claim area with baggage carousels 1 - 5. The Upper Level has two Skywalks to the Parking Garage, and offers food & drink establishments and shops in the Concession Mall (which also has a boarding pass printing station with touch screen, located at the Information Desk. Each Concourse entrance on the upper level has its own security checkpoint: If arriving and departing from different concourses, you need to go through security check at your connecting concourse. 60 charging stations between the gate area seating offer acccess to 6 outlets & 2 SB ports for electronic devices. The stations, 62 inches in height, can easily be seen from further away. Note: The Traveler's Aid desk in the main terminal provides assistance for: language & translation services, ADA & wheelchair service, passenger paging, ground transport in, Lost & Found, and flight & airport information. Concourse C with gates 9 to 25 and presently serves Air Canada, Southwest, United & Volaris. It offers a number of food & drink options, and houses the Airport Administration, ATM, children's play area, and othr amenities. Concourse D with gates 27 to 56 and presently serves Alaska, American, Delta, Frontier & OneJet. It houses the USO lounge (tel. 414-455-8108) for military personnel with a valid boarding pass (located across from Gate D30). and the Delta Sky Club, Best Buy Express kiosk, children's play area, news /gift shops, nursing suit, & shoe shine, as well as food & drink options. Concourse E with gates 60 to 69 and presently serves United only. It houses restaurant 'Cooler By The Lake', an ATM, children's play area, & news/gift shops.